This issue of LinuxFocus brings to you the first articles in a series that explores the 3D programming possibilities of Linux. From libraries intallation to hardware support and various API interfaces! 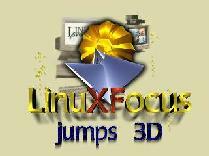 3Dfx Interactive's 3D chipset is changing the world of high-end graphics...and they support Linux! Short description of the Linux Kernel. ddd is a wonderful graphical debugger. In this article the author describes some basic functions of ddd. Learn how to mantain the availability of resources such as routers, hubs, servers and every critical device in the network. The author share with us his experiences putting together an Alpha PC. Miguel A Sepulveda will continue the GLUT and OpenGL series, he will tell us more about GLUT windows managment and more about polygone rendering. Phil Ross will write about the programming peculiarities of 3Dfx cards. Juan M Sepulveda and Phil Ross take on the job of comparing Photoshop and Gimp's functionality.